Home » Automobiles » Self-Driving cars: When Will they Make It To Pakistan? 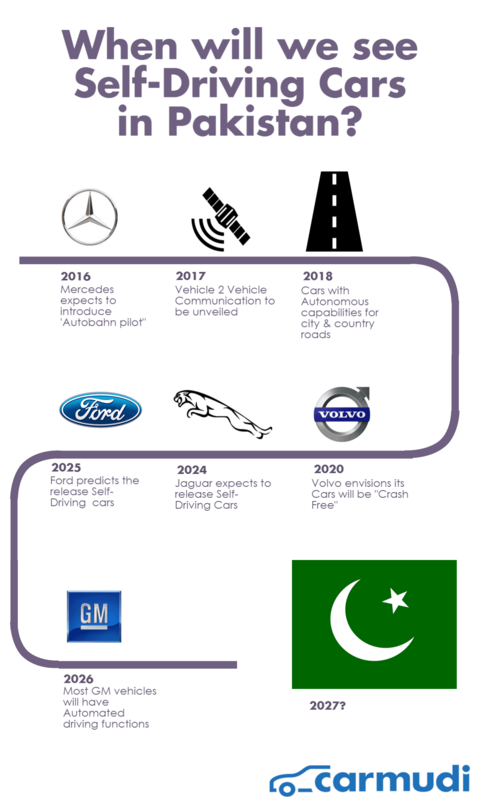 Self-Driving cars: When Will they Make It To Pakistan? Lahore: With a staggering 83 per day, Pakistan is among the most deadly when it comes to driving in Asia. That startling fact, combined with rapid motorisation in Pakistan over the past few decades has meant that it is now home to some of the worst traffic jams in the world. Can Self-Driving cars be the solution? Within a few years, cars will be able to drive themselves, at least in standard situations including driving on highways or in stop-and-go traffic. With Elon Musk announcing that the Self-Driving Tesla car will hit the US road in just three months, will we see a Self-Driving car in anytime soon? Carmudi, the easiest means to sell or buy your vehicle online, reports on when Self-Driving cars will arrive in Pakistan. Research has found that Self-Driving cars, when introduced in the United States, could reduce crash costs by up to $488 billion USD and boost productivity by $645 billion USD. There is no reason why we shouldn’t see similar benefits of the Self-Driving car being enjoyed here in Pakistan. In addition to cutting costs, Self-Driving cars can save lives. The majority of crashes in Pakistan are caused by human error. Given that Self-Driving cars eliminate the need for human control, it follows that Self-Driving cars could reduce road traffic deaths in Pakistan by a massive 90%. This translates to 75 saved lives per day! In addition to saving lives, Self-Driving cars can help solve day-to-day annoyances, including traffic. There are about 7,853,022 registered cars in Pakistan, and drivers can expect to spend up to eight working days a year stuck in gridlocks. Self-Driving cars will help combat the traffic problem by reducing the number of cars on the roads. For example, in the United States, it is predicted that Self-Driving cars could help cut average car ownership rates by as much as 43%, from an average of 2.1 to 1.2 vehicles per household. If we apply these findings to Pakistan we would see the number of cars drop to roughly 4,476,223 which would mean fewer gridlocks and more time spent at the workplace being productive. The good news is that car manufacturers are already offering vehicles to the Pakistan car market that are available to purchase with autonomous features such as basic forward-collision warning systems and automatic braking systems. These safety features already contribute greatly to reducing the risk of accidents by up to 15%. And by 2020, car brands such as GM, Mercedes-Benz, Audi, Nissan, BMW, Renault, Tesla and Google all expect to sell vehicles worldwide that can drive themselves at least part of the time. The Self-Driving car is indeed coming to Pakistan, but it will likely get here in stages as features are added to make our cars safer, until one day we can truly take our hands off the wheel and cruise the streets of Pakistan. ← DRIFTING FROM DEATH TO LIFE! !